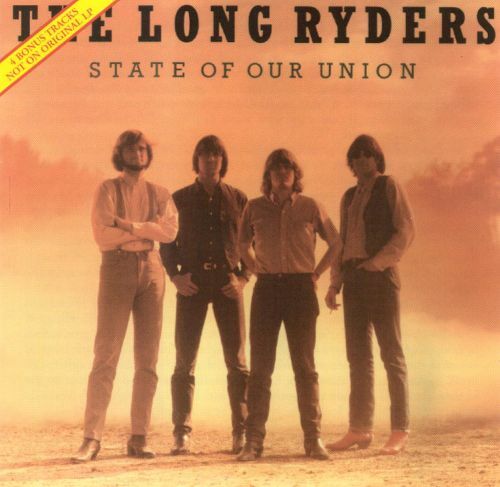 In America, if Love were The Beatles then The Long Ryders were The Smiths. Where Love were pushing the boundaries of what was possible in the folk and early country-rock fields The Long Ryders learned from their mistakes and refined the sound that then allowed bands like R.E.M. and the rest of the post-Paisley Underground renaissance to deconstruct and reinvent again. Pick up any of the best-of compilations released every few years and you would be forgiven for thinking theirs is a back catalogue awash with sunshine melodies and layers of chorus effects but dig a little deeper into their albums (in this case their Rubber Soul and Revolver; or should that be their Meat Is Murder and The Queen Is Dead) and you see a winsome approach to post-punk and politics that disappointingly settles into mediocre MOR as we witness a band run out of ideas a little too quickly. So, while 1985’s State of Our Union is best known for the jangly country-rock of ‘Looking for Lewis and Clark’ there are a couple of huge duffers in ‘WDIA’ and ‘You Just Can’t Ride The Boxcars Anymore’ but elsewhere in the rockabilly (Babyshambles-gone-Dixie) of ‘Good Times Tomorrow, Hard Times Today’ or when nailing the country bum punk of ‘Southside of the Story’, namedropping Jack Kerouac and Neal Cassady along the way, you can hear fleeting moments of what would come to inspire the American alt. scene. No prizes for guessing who was stirred by the mandolin stylings of the sublime and politically charged ‘Capturing The Flag’ and ‘Years Long Ago’, and not just those short-lived north-east heroes The Golden Virgins. Also worth noting the backwards guitars on the latter that the Stone Roses were experimenting with a few years later. Slower, ‘Two Kinds’ is the clearest link between the Paisley Underground and the nascent country-rock scene of the mid-60s that spawned them, blissfully straddling a psychedelic wormhole between the two genres. With this kind of era-defining vision it’s head scratching then that ‘State of My Union‘ not only makes the cut but acts as the title track to what is arguably the band’s strongest overall album, but only pans out into mediocre Status Quo riffage. ‘If I Were A Bramble and You Were a Rose’ is arguably a classic country ballad but the frankly ridiculous ‘Christmas In New Zealand’ is up there with the worst festive songs of the era as State of Our Union peters out two or three tracks too many. Two Fisted Tales, released two years later, is an altogether rockier affair as the influence of the US college scene is evident and which would see band members later associated with acts such as The Coal Porters, Gutterball and The Jayhawks. At its heaviest, on opener ‘Gunslinger Man’, Two Fisted Tales has a frenetic urgency similar to Eleventh Dream Day’s seminal Prairie School Freakout released less than a year later and it’s odd to think of the two bands as peers as the gentler, more countrified Paisley Underground groups made way for the late 80s proto-grunge scene. But all this might be a little misleading because ‘I Want You Bad’ is like the Heartbreakers covering ‘Turn, Turn, Turn’ and ‘A Stitch In Time’ is a welcome reworking of their previous high point ‘Ivory Tower’ (on 1984’s debut Native Sons) that also blends in some of the same progressions as ‘Years Long Ago’. Lucid, linear and note-perfect, it cements the band’s signature sound but, in contrast to the opening track, betrays a very conflicted record with an inward struggle between new wave and country. Elsewhere, hoedowns like ‘The Light Gets In The Way’ (more mandolin, like a proto-Friends theme with a wild west subtext, as if to perpetuate the contradictory nature) were, one suspects, the more natural evolution of the band’s sound although not necessarily as rewarding to the listener; and on ‘Prairie Fire’ which moved away from the Paisley Underground sound altogether into the heartlands rock being popularised by the likes of the E Street Band. Its lyrical themes of marching to Montgomery a subtle acknowledgement of the band’s political allegiance at this time, although the line, “I hope Santa’s not a skinhead” from ‘Christmas In New Zealand’ had previously set out their stall in that regard, if in fact, it was required at all. ‘Baby’s In Toyland’ is little more than a half-realised acoustic joke showing the wilful contrariness of Alex Chilton’s Big Star ten years too late but then on ‘Long Story Short’ the blended harmonies coupled with some great guitar work really pushes themselves stylistically, showing the same flashes of visionary creativity as on State of Our Union at times. But all too often it’s difficult to pin down any definite musical direction. The 80s production and part spoken themes of thinking about the world from an aeroplane in the sky is already Peter Buck-lite and signals the band settling into a safe radio-friendly sound that only two years previously looked like propelling them into cult status, so by the time we get to ‘Spectacular Fall’ and ‘Ring Bells’ the band are really just going through the pub-rock motions. Which, taken as a general progression, is a shame because at their best the Long Ryders of this golden era deserve the high status handed down to the likes of R.E.M. et al and newer devotees of the era such as Wilco, but at their worst… neither album is coherent or cogent enough to be considered a stone cold classic and leaves the band correctly posited as one of a number of high water stepping stones between punk and grunge. State Of Our Union and Two Fisted Tales are reissued on 30th November through Cherry Red.